Today’s shifting demographics, tastes and habits are impacting the processing of modest estates. This blog will explain why it is becoming more challenging to sell long-held “prized possessions” or other items in your parent’s estate. I will explain why many heirlooms and other items perceived initially as valuable, in fact, hold modest value. Finally, I will provide you will some ideas for liquidating heirlooms and related items efficiently. Over the last thirty years, demographic groups that once would have wanted their parent’s belongings, no longer have an interest in those possessions. This change is for a multitude of reasons, but a large part of it is due to societal mobility, the need to maximize the utility in one’s living place, lifestyle trends, and economic factors. The confluence of these factors and the rise of do-it-yourself furnishing that is nearly everywhere today – IKEA, Target, Bombay (via multiple retailers) and the upscale Restoration Hardware – has made a significant impact on traditionally valued items. In short, it is not uncommon today that adult children do not want to hold onto tchotchkes, mom or grandmother’s china pattern, crystal or flatware. Defect or misprint – In some areas such as numismatics, coins that have a minting error on them are significantly valuable – especially when there are few that made it into general circulation. First editions – First editions of items or had features that were removed in future iterations for various reasons. Items in fashion or experiencing upward values – There are items that experience a “boom” or sudden popularity that increase their worth significantly. Mid-century modern has experienced such a boom in demand, thereby making items of that style and era more valuable than ever. If an appraiser has told you that your estate is modest and it wouldn’t make economic sense to use an appraiser or if you have come to the conclusion that you don’t need an appraiser below are some options. Thanks to the Internet it is easier than ever to research the value to items. So take full advantage of it to help you. But where to start? Craigslist: Craigslist can be a good source. Because Craigslist allows you to focus on a narrow geographic region, it can provide more accurate values than values than those on eBay. Just as with real estate, location can be a key factor for the value of a collection, piece or object. Alternatives to Craigslist: There are numerous apps and platforms that can help you liquidate your items or collections. Close5 is a classified offshoot of eBay designed to compete with Craigslist. Facebook Marketplace is another option. LetGo is a relatively new app and platform that allows you to take a photo of the item(s) and quickly set a price or an auction. Its simple user interface is winning over sellers and buyers alike. As you can see, there are numerous options to sell modest estate or belongings. 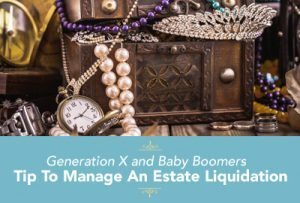 There are other options such as estate liquidators, but I’ll cover that topic in another blog, so stay tuned.